Access Control. Bolton Lock Company Ltd. North West's leading supplier. Bolton Lock Company Ltd are rapidly becoming one of the North West’s leading supplier’s and installers of Access Control and Security products. In the fields of physical and information security, access control is the selective restriction of access to a place or other resource. An access control point, which can be a door, gate, lift or other physical barrier, where granting access can be electronically controlled. Typically, the access point is a door. 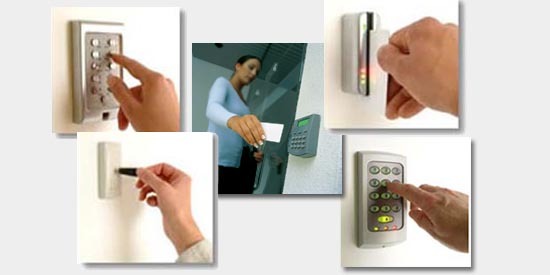 An electronic access control door can contain several elements. At its most basic, there is a stand-alone electric lock. The lock is unlocked by an operator with a switch. To automate this, operator intervention is replaced by a reader. The reader could be a keypad where a code is entered, it could be a card reader, or it could be a bio metric reader. Readers do not usually make an access decision, but send a card number to an access control panel that verifies the number against an access list. Generally only entry is controlled, and exit is uncontrolled. Exiting a door without having to electrically unlock the door is called mechanical free egress. This is an important safety feature. In cases where the lock must be electrically unlocked on exit, the request-to-exit device also unlocks the door.